So many of you have asked & here I am, ready to answer...with a tutorial! 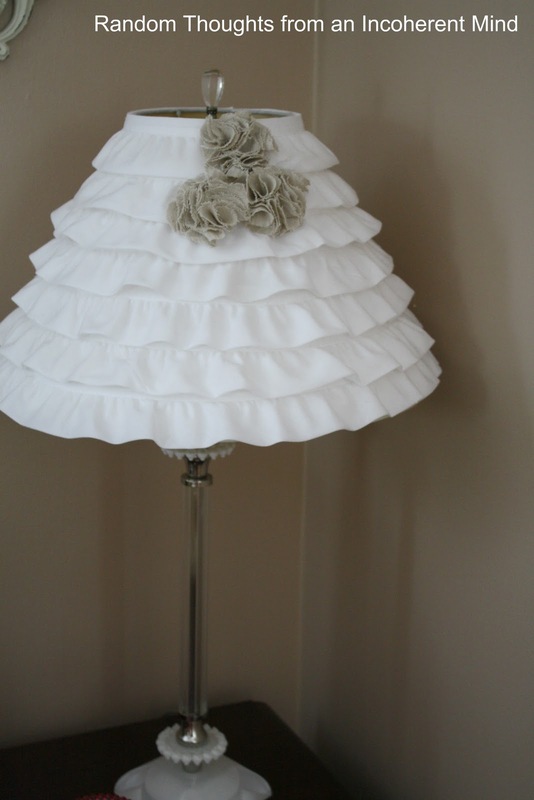 As many of you know, I made this ruffled lamp shade last year. This is the tutorial for how to make the Pom Pom flowers that I used on that lamp shade. Yes, I can hear them too...the angels are singing. Now bear in mind, I am not a master tutorial giver, ok? Also, I do not want to hear a single snicker at the condition of my dry-and-badly-in-need-of-a-manicure hands, ok? It is winter in New York, afterall. I'm feeling a little sassy today, can you tell? Now that we've got that squared away, here we go! 1. Gather some supplies: fabric, scissors, hot glue gun, a round shape to use as a template. In case you might like to know, I used Osnaburg for my lamp shade flowers. The Osnaburg fabric was great because it has a tendency to fray which was the look I wanted with the lamp shade. 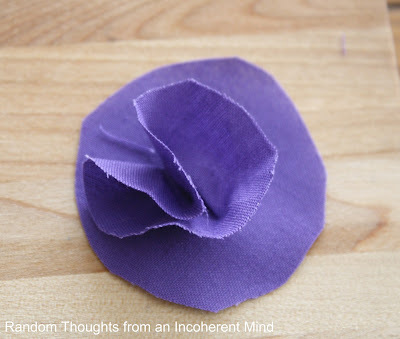 Today I'm using this purple cotton because hey, I just feel like it. 2. 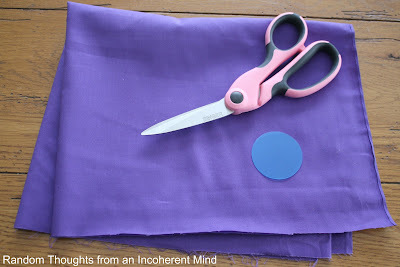 Trace & cut several circles (about 10) from your fabric. The size of your circles depend on how big you want your flowers to be. The circles shown here are roughly 2 inches in diameter. Your circles do not need to be perfectly cut. Sometimes it's fun not being perfect. 3. 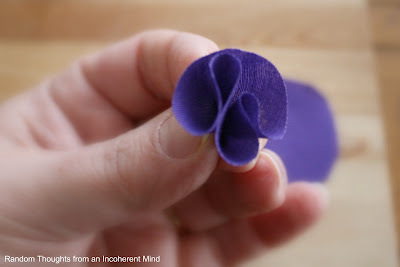 Take one circle and place it in front of you to use as the base of your flower. You will glue all the other circles to this piece. 4. Take another circle and squish it up at the center, so it looks like this. 5. 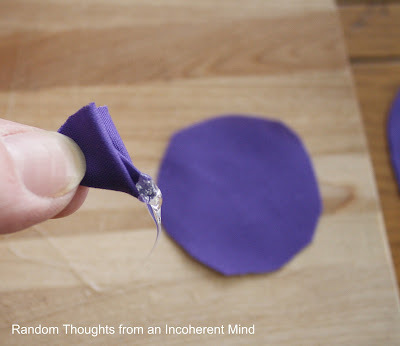 Add a bead of hot glue to the tip of the squished up circle. 6. Stick glued piece to center of circle base. 7. 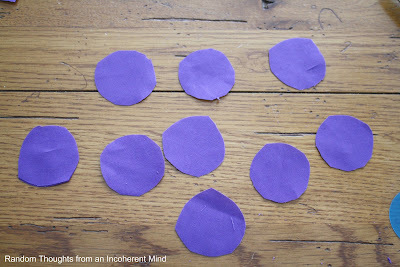 Repeat with the rest of the circles, gluing them to cover the circle base. Eventually you will have something that looks like this. I don't really have a set number of circles you need to glue down. I just keep gluing and filling in until I think the flower looks full enough, covers the circle base & is shaped to my liking. In other words, I just wing it. I think these Pom Pom flowers are great because you can use them in home decor, for pretty headbands, purses, or even for jewelry. If you should have a question, need me to explain, clarify, or talk you through it, do not hesitate to ask me. I do realize that tutorials often get confusing. I shall do my best to help you. I aim to please. Yessiree, I aim to please. I thank you all for visiting today. Now run off and adorn your home and/or self with some Pom Pom flowers, k? Yes, I am exhausted from packing....However, it will be fun unpacking all those boxes! It will be like Christmas again! I have had several things including new pieces in storage for 6 months. 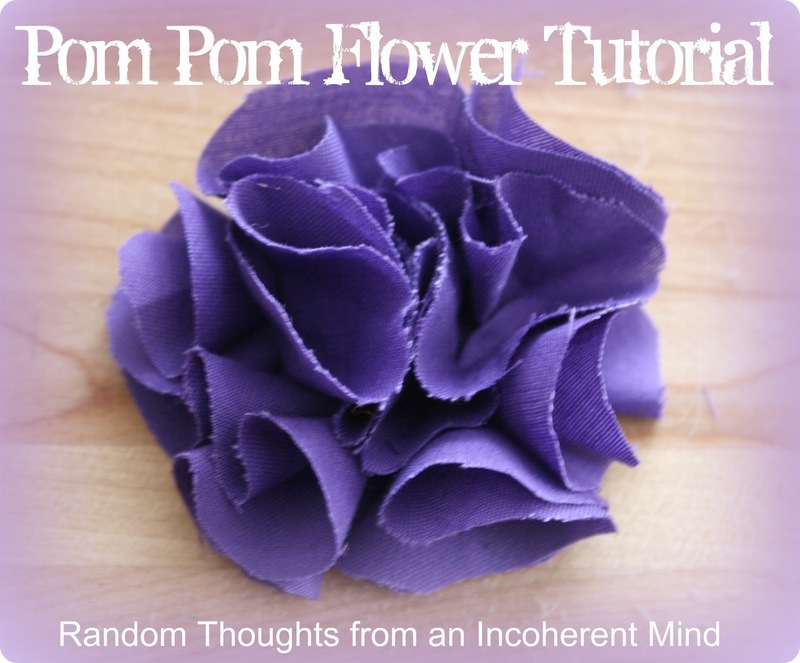 I love the pom pom tutorial. Your lampshade is so pretty. Thanks for sharing! Ohhh...I can do that, how cute Gina! Thanks for the TUT! LOL...you should see my feet, talk about bad...your hands look fine. Those are adorable. Thanks for the tutorial. I am definitely going to try making those. As good as a tutorial that was, I would still be hopeless with this and would most likely end up covered in glue! PERFECT TIMING! Thank you, Gina! Tonight, I am making fabric flowers to decorate a wreath and a 2 foot high initial for a welcome baby girl shower this weekend! Oh those are so cute! Never thought it'd be that easy! Thanks for sharing! I have everything needed to make those =) Yay. I think I can. I tink I can. Very cute! Thank you for sharing your lovely project at Potpourri Friday! Wow, your lampshade is fabulous and accidented with the flowers, it is incredible. I am going to have to put this on the to do list! I have done some of the flowers and they are so fun and easy but I love your application. YOu are a master tutorial giver!! I am booking marking this one, because I Have to try it and (Then I will know where I got it!) Thank you! I love it! These are gorgeous and look remarkably easy for my craft challenged, cluttered brain. OH WOW, this is a great tutorial, Gina!!! These are gorgeous and I remember those on your lamp because they are so adorable!! OMG so cute! Thanks I want to make some of these!!! 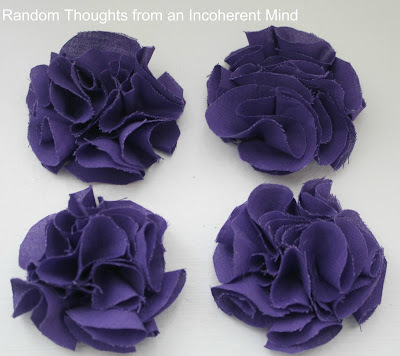 I am so inspired by these little ruffled beauties! Thanks for the toot.....they look like easy and fun! and that's a great combination in my books. Gina, I think you are a master of tutorials! You explained everything as clear as a bell. 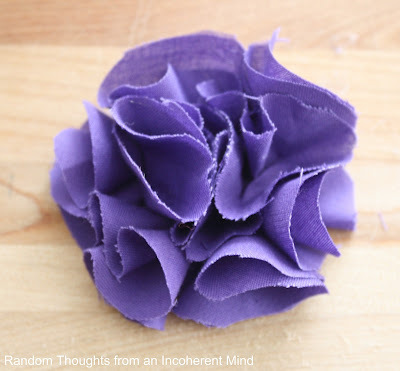 I can see one of these flowers being made of lace and pinned to a jacket. Well, actually, I paid for one of those lace flowers that I pin to a jean jacket. Now I can make my own! Wheeeeeee! Gina, No snickering here! Those look great, I adorn something with them! Great job on the tutorial Gina. I think these little pom pom flowers are soooo cute. Sweet! Have a wonderful weekend my friend. Hmm...i may have to pom pom myself tomorrow! Thanks for the lesson, Gina! I have never had a manicure in my life. Clear and natural are the only colors on my nails! I am a plain jane for sure! I've been wanting to learn how to make these! Thanks for the tutorial, Gina! I just stopped by your blog. I found you on Lemon Lane Cottage (in her followers section :) I really like your blog. you are very talented. I like the little flowers you made!! The lampshade looks wonderful!! I'm following you now :) Have a wonderful Sunday! Wow! great tutorial. I am always challenged with glue but definitely worth the try! I hope you're having a great day! I just wanted to let you know that you are featured on my blog today!! !